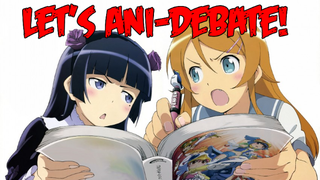 AniDebate? Let's try to get this started up again. A while ago, we wanted to do something on AniTAY called AniDebate, but we never it rolling because of timing issues. I'm changing the structure of it a bit, and reshaping this so hopefully we can get this up and rolling. 1) I got rid of the moderator bit because I'll try to get this running myself so others don't have to do it, and for the ones that we have someone else, just leave it in the comments. 2) Here's the big thing: I changed the team system around a bit. Now, Once we get 1 person per side, I'll start getting it rolling, 2 people max per side. If there are more people interested, I'll put them in the backup so they can participate if there is nobody else able to do it. Hopefully, this will iron out the schedule issues we've had in the past. 3) More Aggressive scheduling: People typically like to talk about things when current, so I'm going to try to schedule these ASAP or when most important. This'll prevent things like A.Z's debate going into obscurity. Check out the original article, and the spreadsheet so we can actually do this.